The working description of Texans RF Shannon’s music is “South West R&B and psychedelic trail ballads.” The R&B side may be a bit difficult to unpack, but the “psychedelic trail ballads” part is particularly spot on when characterizing the six songs on the Jaguar Palace album. Jaguar Palace doesn’t work because of its individual songs — hazy, languid and often clocking in at over six minutes apiece, they’re winding snapshots of moderate sonic intrigue. Taken as a full collection, however, Jaguar Palace is a panorama, a sprawling 360 degree exploration of twilight desert night skies, lonely roads and railroads, and the end-of-the-line one-gas station towns inhabiting those edges. It’s the smaller moments in this musical universe that make you feel like you’ve just stumbled upon a long lost ghost town. “Tell My Horse” may be the dark inverse to America’s “A Horse With No Name,” with its foreboding keys, otherworldly slide and chaotic shoegaze touches. “Had a Revelation,” the relative peppiest track on the album, ends up being less about RF Shannon leader Shane Renfro’s revelations and more about one’s own epiphanies that take place while listening. “Hottevilla,” meanwhile, provides the most headphone fodder to get lost in. The slow draw of its beginning recalling the more discreet moments on Godspeed You! Black Emperor albums and its dizzying flute parts add dangerous firefly flare-ups for the mind to chase. This carefully crafted world created by RF Shannon triangulates the swirling cosmology of A Storm In Heaven-era Verve, the hypnotic guitar lines of Neil Young’s “On The Beach” and some of Calexico’s more downtempo moments to create something of meditative, lasting beauty. The best way to quantify The Besnard Lakes’ fifth album is A Coliseum Complex Museum is to realize that they’ve distilled their sound down to its most Besnardian essence. A casual observer might misinterpret this as more of the same — and in many ways A Coliseum Complex Museum *is* similar to pass Besnard efforts, the band once again holding steady to their distinctly gauzy space rock sonic palette — but dismissing the record in this way ignores the sharper focus and refinements in The Besnard Lakes’ game. All of the band’s hallmarks are there: the pristine textures, the deliberate build-ups that pay off in explosive, technicolour crescendoes, and the dark, often otherwordly song subjects (this album appears to revolve around magic and mythical beasts, see “Necronomicon,” “The Bray Road Beast”). It’s in the fine details, though, where The Besnards exceed the stiffer previous record, Until in Excess, Imperceptible UFO. Primary vocalist Jace Lasek seems, improbably, to be singing even higher than previously, which works to great effect when paired against the deliberate mechanical chug of standouts “Golden Lion” and “Towers Sent Her to Sheets of Sound.” The Besnards near-defiant devotion to the classic rock guitar solo also yields wonderful results on “Pressure of Our Plans” and the dramatically good closer “Tungsten 4: The Refugee.” The revelation on A Coliseum Complex Museum, though, just may be the use of Olga Goreas’ bass. Deployed with strategic effectiveness on “Nightengale,” “The Plain Moon” and “Golden Lion,” these insistent pulsing thrums magnificently set up the band’s most melodramatic moments. All that said, what might be most intriguing about A Coliseum Complex Museum is its air of craftsmanship. The album feels like something pieced together thoughtfully and methodically, all with the grand intention of blowing our minds. Looking to expand my “following” list beyond bikini tramps and people who I may or may not be professionally jealous of, I recently started following NASA on Instagram. It’s a follow that’s provided me with a wonderful supply of cosmological magic. Every day these space voyageurs capture some exotic new slice of our universe and place it right in our hands like technological Zeuses doling out mind-thunderbolts. Just the other day I learned about NGC 3610, an elliptical galaxy roughly four billion years old. My mind is still trying to process the photo of the Veil Nebula published a few weeks back. They call it “delicate, draped filamentary structures,” but I’m convinced this is really what Geddy Lee sees when he closes his eyes. The point I’m trying to make in all this is that, yes, sometimes the stars are within our reach. They’re out there. Shining. Sparkling. All you have to do is be strong enough to stretch your arm out and grab them. Rarely has such bravery, such indomitable spirit been committed to the recorded form as when Tim sings the hits on Tim Sings! The Hits! Weaving his way through 44 of the greatest songs of all-time from Aerosmith’s space exploration epic “I Don’t Want To Miss A Thing” to Wilson Phillips’ iconic “Hold On” Tim always pushes forward, resolutely overcoming his condition to capture the very soul of each song. In many ways Tim Sings! The Hits! is just like those NASA probes and telescopes that are continually monitoring our skies. Can they explain all the mysteries of the universe? No. Can they unravel the science behind dianetics? Not likely. Do they need someone to help cut up their dinner so they don’t accidentally choke on their ham? Sure, but needing a little help won’t stop Tim from from pursuing his dream: To bring us back little pieces of stardust each and every day in the form of song. That is the true journey of Tim Sings! The Hits! Tagged as Album Reviews, Marty Topps, Music, Tim Gilbert, Tim Sings! The Hits! There is, however, more to dad rock than Jason Segel and Paul Rudd’s I Love You, Man Rush jam outs in the man cave. Take, for example, the new album The Breaks by former Boo Radleys/Bravecaptain frontman Martin Carr. Though not quite an existential parenting crisis concept album, there’s clearly been a lot of self-searching on The Breaks. This is perhaps best exemplified by the escapist track “Mountains.” A shimmery pop plea, “Mountains” is Carr looking to get away from something. What that is, he doesn’t explicitly say, but a suspicious mind could easily come up with any number of uncomfortable notions. “Senseless Apprentice” perhaps most approaches Carr’s Boo Radleys past with its hearty groove and series of sha-la-la-la-las, but its more of an evolution-from than a return to his white noisier past. What this song and insidiously melodious opener “Santa Fe Skyway” most reveal is a Carr whose years of experience have made him a master pop craftsman. Where Carr’s higher profile former Creation Records colleagues’ mystique has deteriorated over time — Oasis have imploded, Primal Scream’s constant sonic adventuring’s getting desperate, My Bloody Valentine have beaten their paralysis only through repetition, and Jesus And Mary Chain have become a nostalgia act — the nagging listlessness Carr taps into on The Breaks is essential to the vibrancy of his new songs. Paradoxically, getting old and having kids is keeping Carr sharp. And the songs on The Breaks are just as relatable as “Wishing I Was Skinny” or “Wake Up Boo!’ were some 20 years ago. 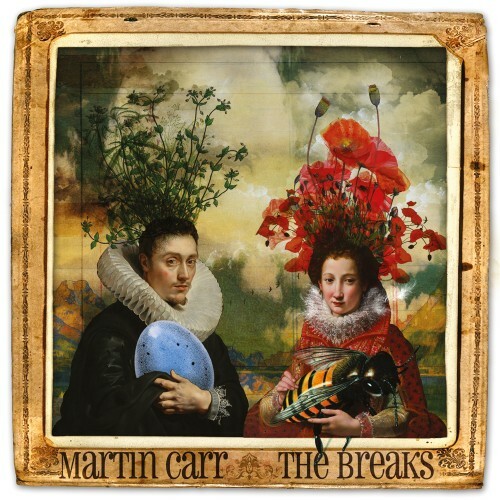 On The Breaks Martin Carr directly confronts his slow descent into adulthood — something we all have to do — and if that makes this album “dad rock,” then there may be some worth to dad rock after all.